This home’s friendly façade is due in part to traditional shingles and a peaked and gabled roofline. Thanks to cutting-edge products, the architect was able to use durable yet beautiful materials to withstand coastal weather. The wing at left is pushed back from the rest of the house to facilitate parking and to avoid the sense of “looming” over the sidewalk. The rear façade is all about exterior access. Walls of glass doors make the most of the surrounding views. Wood and cable railings bring an industrial touch. 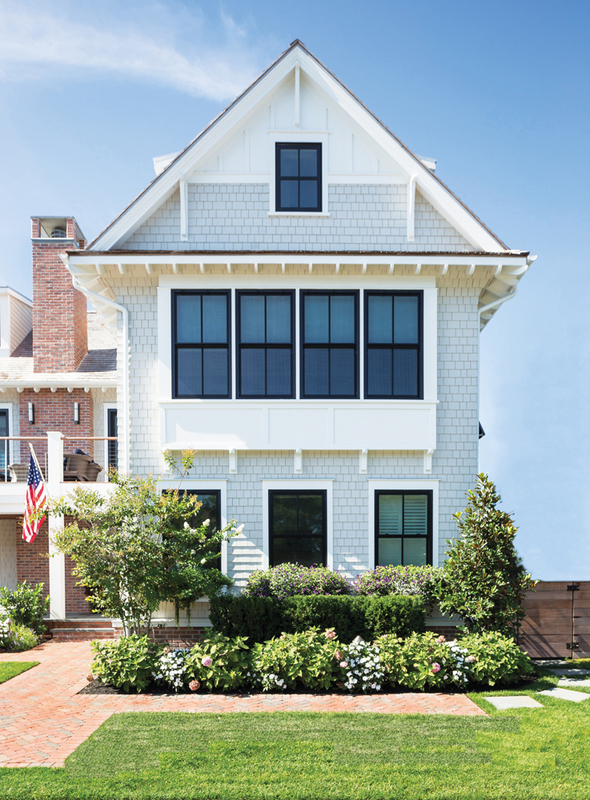 In Avalon, traditional shore styling gets a modern nudge. This home on Seven Mile Island located in New Jersey, the barrier island divided between Avalon and Stone Harbor, has a graceful simplicity. Maybe it’s the shingled façade or the peaked roof, which give it a pleasing familiarity. Maybe it’s the aesthetically appealing precision of the proportions, an abundance of windows balanced with just the right amount of embellishment. It has a traditional vibe, yet there’s something different. This home’s subtle charm comes from the combination of customary components and unexpected additions. Mark Asher, AIA, NCARB, of Asher Associates Architects in Jenkintown, Pennsylvania, designed the home along with Project Manager Laura Glantz. 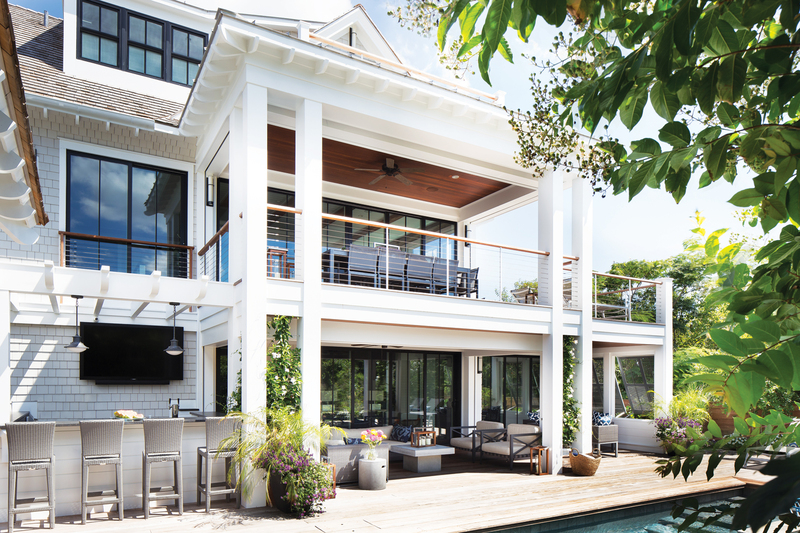 The team finessed the standard seashore look and created a home with urbane—even industrial—elements that still reflects a seashore sensibility. DNJ: Describe the style of this home. ASHER: Like so many of the homes we design on the coast, and particularly in Avalon, NJ, there is a coastal regionalism at play. The forms and major materials are traditionally based, but there is a more modern aesthetic. 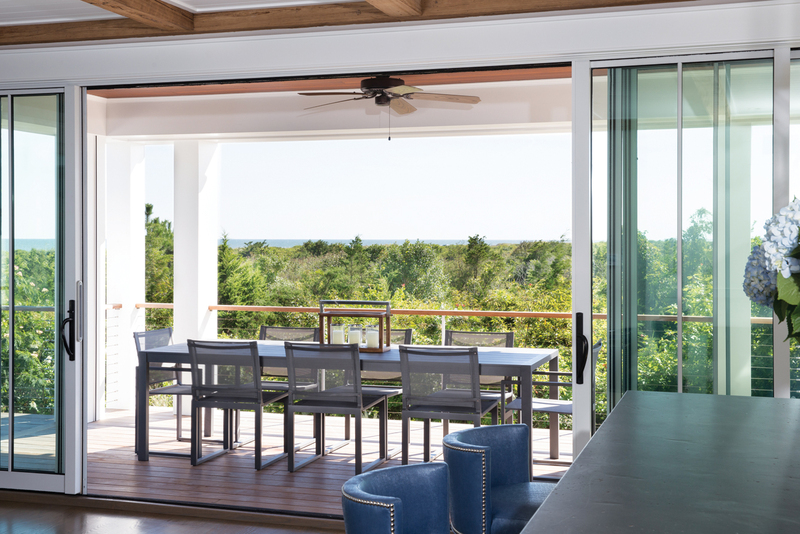 This gentle integration of styles—the “cable rails” on the upper decks, for example—implies a more modern edge while opening the home to the ocean and dune views. Similarly, we want this home to stand the test of time. We try to avoid the more cartoonish turrets and “window catalog” school of architecture, relying instead on the tried-and-true methods of good proportions and historical concepts. DNJ: What is this style’s architectural significance? ASHER: This home is quietly beautiful and is replete with details that add to the richness and texture of Avalon’s vernacular. While using materials you’ll see in coastal communities, here we wanted to make something with clean lines and simple, yet sophisticated details that gently meld traditional and modern. The eave is something special. We’ve traded an ornamental crown for a clean fascia and exposed rafter tails with a streamlined profile. The cedar shingled walls curve out to receive that eave. Those types of details provide a subtle signal that there is something new and now about the home’s style. DNJ: What were some of the challenges of this project? How did you deal with them? ASHER: As with any oceanfront home, the views are considered first and foremost. The site was unique in that the island steps inward at this location. As a result, the views are not just along one oceanfront face, but open in a more panoramic vista. Of course, the rooms and glass are situated to take full advantage of that. In this case, the dunes provide perfect screening and protection for the backyard pool. DNJ: What issues did you have to consider because this home is in a beach community? ASHER: Beach communities are under enormous pressure these days. Building codes have become very stringent, coastal flood maps change and local zoning codes play a critical role in shaping the home. FEMA regulations determine the flood elevation, which in-turn sets our first-floor elevation. We are well versed in these issues because we have designed hundreds of coastal homes; nevertheless it’s a matter of staying abreast of the changes. DNJ: Explain the importance of scaling the home to the property, especially in a beach community. GLANTZ: We are particularly mindful of scale to the property, but moreover we always want our homes to be “good neighbors.” Avalon is a three-story town. While this home has three floors, we’ve managed to keep the appearance of a two-story home. The front porch, pulled back from the rest of house due partly to necessity for parking, creates breathing room facing the street, avoiding a three-story mass looming over the sidewalk. 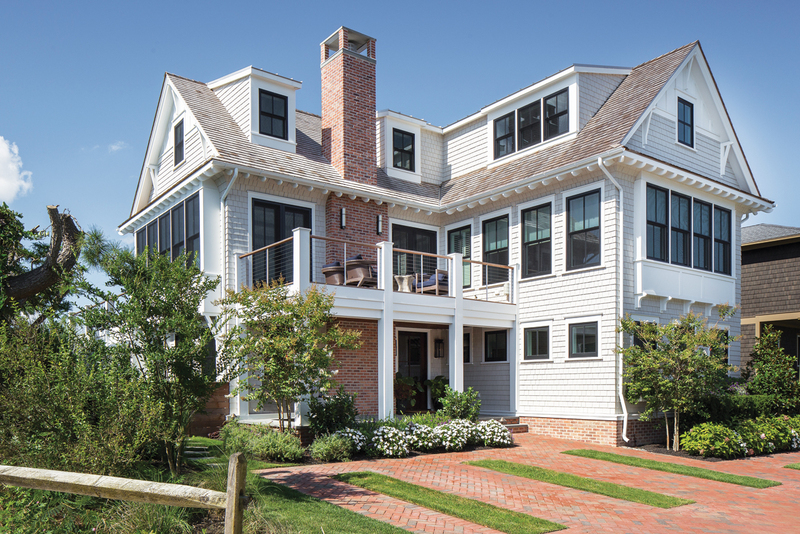 With this home located on the beach and close to a beach entrance, creating something that was both inviting yet stately was important. This design accomplishes both. Its gable end faces the street, creating a sort of dialogue with the rest of the homes on the block. DNJ: What do the homeowners like best about it? GLANTZ: There is nothing quite like living on the ocean. The beauty is inescapable with constantly changing views of sky, clouds and sea. The dune grasses and vegetation change with the seasons. One of the keys to a successful family home is a range or array of living spaces. In this plan, the living, dining and kitchen areas, all oriented to capture views, flow into one another in a way that is open yet distinct, connected but separate. The home accommodates a house full of friends and family on a summer weekend, yet feels comfortable for a quieter fall getaway. The owners love the flow of the home for indoor/outdoor living and entertaining. They appreciate the comfortable, casual style and the ability to open the doors and have a great gathering. 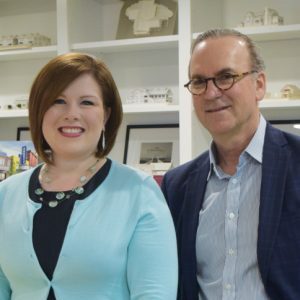 Architect, Mark Asher, AIA, NCARB, principal, and Laura Glantz, project manager, of Asher Associates Architects in Jenkintown, Pennsylvania; outdoor furnishings, Rachel Kapner of CWI.Design in New Providence; construction, Brian Stuart of D.L. Miner Construction in Cape May Court House; exterior siding, Maibec Cedar Shingle siding in Benjamin Moore 859 “Collingswood”; A-series windows, Andersen Corp.; standing seam metal roofing in “Silversmith,” ATAS International Inc. in Allentown, Penn­sylvania; sliding glass door systems, Solar Innovations in Grove, Pennsylvania; exterior trim and board and batten details, AZEK Building Products in Succasunna; exterior brick, “Old Georgetown” from General Shale in New York City; Endurian Bahama shutters in “Slate Stone,” Timberlane in Montgomeryville, Pennsylvania; landscaping, Hess Landscape Architect Inc. in Lansdale, Penn­sylvania, and The Garden Greenhouse & Nursery in Cape May Courthouse; “Rumbled Main Street” brick, Pine Hall Brick in Madison, North Carolina.